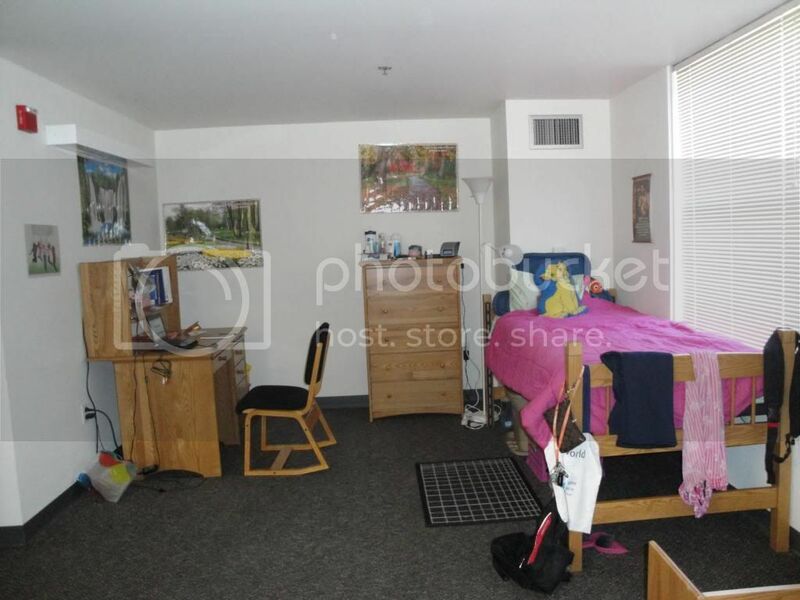 As a junior, I was really lucky in the campus housing lottery and landed myself a "dingle". (For any non-college students reading this, that's a single student living in a double, a room meant for two). I had more space than I knew how to use. And this was just my side. This arrangement, which came without the company of a roommate, did get lonely sometimes, but it also gave this introvert the privacy she treasures. It had a thermostat just for me and a carpeted floor beneath my toes. It was able to contain all of the family and friends who surprised me there, on two separate occasions, for my twenty-first birthday. The two beds gave me the freedom to have sleepovers whenever I wanted. But do you want to know the best thing about that room? I had my own bathroom. This quickly became a running joke between me and a few of my close male friends. (Well, it was a joke to them, at least; it was quite serious to me.) If one of them came by to visit and really needed to go, they were, without fail, directed to the elevator so they could use the little boys' room on the ground floor. I have been known to body-block my bathroom doorway (insert obligatory little-person joke here) when necessary. Apart from my insistence about leaving shoes at the door (since I was the one cleaning the carpet, not the boys), this was my only rule. Judge me if you must, but I made a plan years ago: I would not be sharing this private space with someone of the male variety until said male put a ring on my finger. Why have I gone into such detail about bathrooms, of all things? Because after I moved here, that plan I just mentioned to you flew out the window. Because this morning, a petty issue about the bathroom (yes, I'm completely serious) is what had me back in bed for the first time in days. After weeks, I'd learned to tolerate living in a co-ed house. I'd gotten used to it. But this morning, my temper flared hot and wild and unfair over something that at this point, wouldn't have been an issue. On a normal day, I would have given grace, washed my hair later, and it wouldn't have mattered. But things don't feel normal right now. Normally, I would've pulled myself out of bed and gone to class today instead of crying and taking my millionth nap of the week. Normally, I'd be looking forward to my summer, even in November, because summer means Bangalore. As a child, I didn't grow up at camp during the summers, and I've never regretted that. I had the privilege of spending my summers growing up in the house where my mum - the best one in this world, hands-down - grew up. I spent my summers in a home steeped in heartwarming history, unlimited cuddle sessions, and afternoon tea. That - that is my normal. Nothing else about today was normal. Like a small child, I screamed, "Not fair, not fair, not fair!" (in my head), dove away from my shame into the safest place around here (my bed), and wept hard at 8:30 am for everything that isn't normal. Nerves frayed and unwinding, I found a song a friend sent me some time ago...and ached for it to make everything normal again. And I ask the wall, with the sharpest bitterness: God, weren't You supposed to be guarding her heart? Weren't You supposed to be guarding mine? 37 days until I see my family. 65 until I see my friends. The sun has set now, and I've realized it was Grief yelling this morning - not me. Friend, may you never know such raging, destructive pain.